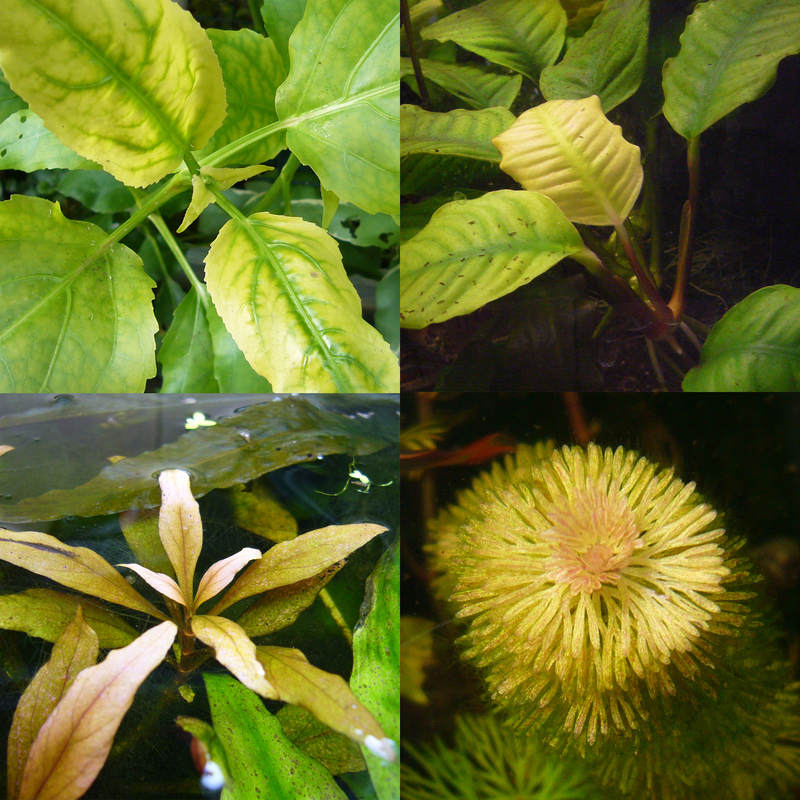 Typical Symptoms of Iron Deficiency of Gymnocoronis, Anubias, Alternanthera and Cabomba. Description: Iron is an indispensable nutrient for plants. It is important for the formation of the green leaf pigment (chlorophyll) and its absence causes a lightening of the newly formed leaves. Plant damage: The youngest leaves are lighter than usual. Affected are the shoot tips in stem plants and in rosette plants the heart leaves. First, the areas between the leaf veins light up, while the veins remain green. Later, the leaves are completely discolored. In light green to dark green plant species, the leaves are usually lemon yellow. In species with reddish leaves they turn whitish. Assessment: One of the most common nutrient deficiencies in the aquarium. Regular fertilization with a micronutrient fertilizer helps. One-sided iron fertilization with pure iron fertilizers should be avoided, because over-fertilization with iron promotes the occurrence of other micro-nutrient deficiencies. For more information, visit our Nutrient Deficiencies page.